38’ - Clint just made a pass out to the wing from his bum. 39’ - Yellow card for Marco Pappa for a tackle on the counter there. That happens. 40’ - NYC pressing for that equalizer now. Grabavoy gets into the area and swings the cross in but it’s headed out for a corner by Mears. 40’ - Then #AirMarshall gets in there and says NOPPPPPPPEEEEEE. THE MOST EPIC. RT @bjmontoya: @LIVESounders how epic will Oba's dred-fro-hawk be by the end of the season? 44’ - Yellow card comes out to @TyeMears for being too much of a studmuffin. 45’ - Good FK chance for NYC coming from the right of Frei’s goal. About 24 yards out if I’m guessing (which I am). 45’ - Okkkkk then. FK has to be retaken for some reason. 45+ - And it ends up going out of play. HT THOUGHTS: NYC has a band called City Beats. That’s cool. 46’ - We are back! @NYCFC gets the second half going with the @SoundersFC leading the match 1-0. 46’ - The corner is a weak one though and Ozzie clears it with noooooo problems at all. 1-0 Seattle. 48’ - NYC on the old front foot to start the second period. Testing the Sounders early. Defense looking good. Corner coming. 49’ - Corner comes in, causes some issues and Dylan plays it out for another one. 49’ - This one is met by #AirMarshall and cleared outta there. He does that, you know. 50’ - And now a yellow card for Mix as he takes down Andy Rose. YOU DON’T TOUCH MY ANDY! WHAT KIND OF NAME IS MIX ANYWAY!? 51’ - WOW WHAT A TACKLE BY REMICK! Beautiful movement by NYC as the ball is played into the Sounders area. Looks like a tap in but NO! 51’ - Huge moment there. Mullins should have finished easily. 52’ - Dylan Remick is my special man. 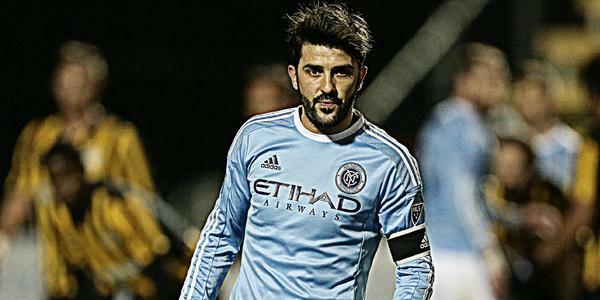 53’ - David Villa looks set to check in. RUH-ROH! 53’ - Sounders getting a bit more of the ball now. Working it around nicely. Keeping it in play to delay that NYC sub. Smart move. 54’ - Goal for NYC! On the counter, the ball is played out to the top of the box. Ballouchy takes and bangs home…then is subbed off. 55’ - Sounders back on the offensive now. Trying to get one right back. Some good defending though slows the move. 56’ - Mix gets forward after a layoff from Villa and has a crack but it’s deflected out for a corner. NYC eager. 57’ - Foul in the box! 58’ - Marco and Mix do a little dance in the middle of the park with Marco winning out. That was fun kinda. 58’ - Just a tiny bit of space as the ball is played into him and he slides the long shot across the goal to beat Josh S.
59’ - That’s @clint_dempsey’s 5th goal of the season. I love him five thousand times as much as I did before.